What's wrong with up in the air? 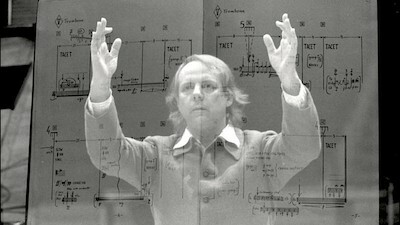 Composer Karlheinz Stockhausen, and one of his scores, around 1980. On Friday and Saturday at 7:30 PM, the Nightingale will screen Frank Scheffer’s Helicopter String Quartet (1996), which documents composer Karlheinz Stockhausen’s creation of the eponymous work (too bad they aren't showing it on a double bill with this). 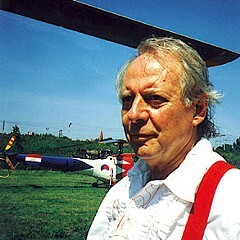 As I learned, the title is no metaphor: Stockhausen actually composed a string quartet to be performed by musicians in four separate helicopters. It’s the sort of project that Werner Herzog may have imagined (or at least filmed, had Scheffer not beaten him to it), and Stockhausen often comes across as a Herzogian hero, searching for radical new possibilities in his field and claiming to take inspiration from dreams. I’m a dunce when it comes to the music, but I found the movie fascinating, in part because the story has so much ready-made suspense. Any number of things could go wrong in the execution of the quartet, and it’s entertaining to see how the composer and his crew respond to each problem that arises—it's something of an intellectual action movie.